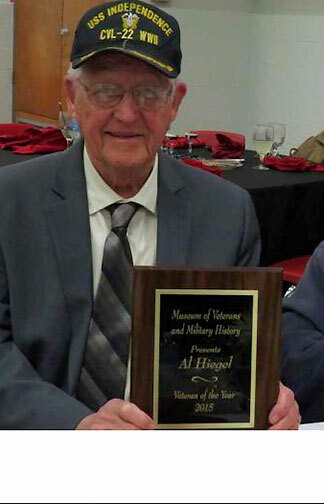 Al Hiegel of Conway, assumed the title of Faulkner County Veteran of the Year as presented by the Museum of Veterans and Military History in Vilonia, saying he would accept it in honor of his shipmates who did not make it home. “There were 52 who did not make it home,” Hiegel said, addressing an audience at the Vilonia Area Chamber of Commerce, Saturday night. He served in the U.S. Navy during WWII. He was a radar operator who participated in the battle of Okinawa, museum member Brian Anible said, presenting the award. “Mr. 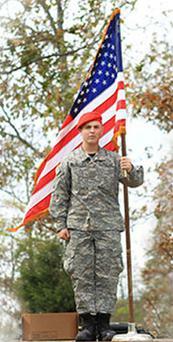 Hiegel is a hero—one that deserves the recognition,” Anible said. Reading Hiegel’s biography, Anible said, the veteran was born Oct. 1, 1926, in Conway. He joined the Navy when he was 17. He went through boot camp at the Naval Training Station in San Diego, California. He boarded a troop ship Valentine’s Day, February 14, 1945, that took him to Hawaii. One week after being in the naval base, he boarded the carrier USS Independence. Admiral Bull Halsey was waiting at the Island of Ulithi for all the firepower he could muster, Anible said, before beginning the Battle of Okinawa. The greatest firepower in the history of mankind was at anchor. Most of the fighting ships that participated in the battle of Normandy were there. Hiegel was on the only carrier that participated in the Okinawa battle that did not get hit by the Kamikaze. The Navy lost more men in this battle than any other in history. After Okinawa, Hiegel saw action in Hokkaido and other Japanese home islands. His carrier transported 33 airplanes and lost 105 during the war. Fifty-two of his fellow soldiers were lost or buried at sea. When the war ended, Hiegel’s ship entered Yokohama harbor and he spent a few hours touring. His ship participated in the Magic Carpet campaign—transporting troops to the U.S. from the Pacific. at the Faulkner County Courthouse. He served as president of the Red Cross, president of the Conway Noon Optimist Club. He was also a board member of First State Bank, a boy scout leader and president of the Conway Booster Club. He served on the Bazaar and Finance Committee at St. Joseph Church where he is also a lifetime member of the church. He has also worked at and operated Hiegel Lumber Company for 50 years. He regularly shares his story of WWII at schools. Congratulations to Dwight Witcher of Conway for being awarded the 2016 Faulkner County Veteran of the Year.